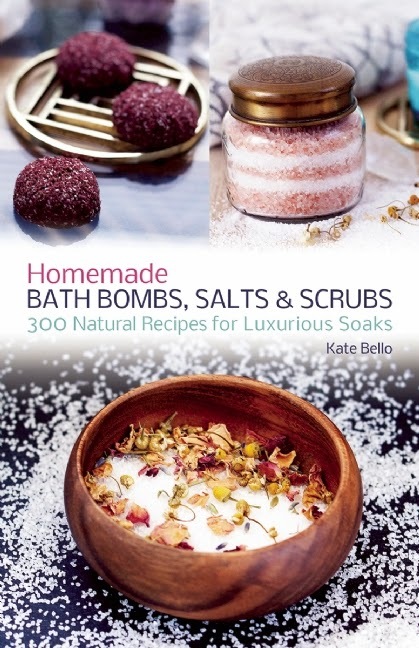 Writer, photographer and now author, Kate Bello has just released her first book Homemade Bath Bombs, Salts & Scrubs. This collection of 300 easy and fun DIY recipes are perfect for the Girly Girl that loves to relax in the tub. Kate's creations are all natural and will elevate your soak and relieve common ailments such as stress, allergies, acne, dry skin, sunburn and more. Treat yourself with fragrant petals, powerful essential oils and ingredients like sage, lavender, peppermint, rose, jasmine, himalayan sea salt to name a few. You can find out more info on author Kate Bello by checking out her web site www.katebello.com. There you can follow her blog, read her works of fiction and check out her photography. Homemade Bath Bombs, Salts & Scrubs will be available for purchase later this month, but if you can't wait till then you are in luck. I am giving away a copy to one lucky Girly Girl. To Enter: Leave me a comment telling me what your favorite natural scent is. You can get extra entries for liking Kate Bello on Facebook or following her on Twitter. This giveaway will end on April 17, 2014. I will choose the winner using Random.org. Please leave a valid email address if is it not visible in your profile. US entries only. I love lilacs...which are blooming right now! !